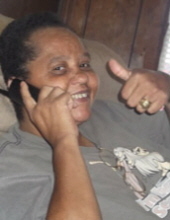 Ms. Monica Denise “Nesie” Wilborn, age 61 of North Wilkesboro passed away Sunday, March 24, 2019 at her home. Funeral services will be held 1:00 PM Wednesday, March 27, 2019 at Reins Sturdivant Chapel with Pastor Brent Bailey, Rev. Keith Knox, Rev. Casey Walker, Pastor Arthur Ferguson, Sister Shelby Parsons and Sister Pam Phillips officiating. Burial will be in Old Damascus Cemetery on Old 60. The family will receive friends from 12:00 until 1:00 prior to the service at Reins Sturdivant Funeral Home. Ms. Wilborn was born November 5, 1957 in Wilkes County to Eleanor Marie Wilborn. She had been employed by Tyson Foods and was a member of Grace Kingdom Life Ministry. Ms. Wilborn is survived by her mother; Eleanor Marie Wilborn-Hamilton and stepfather; Clifford Hamilton, a sister; Melissa Richardson and husband Daniel of North Wilkesboro, two brothers; Victor Wilborn and Patrick Wilborn both of North Wilkesboro, a longtime friend; Christine Severt and special nephews and niece; Zechariah Wilborn, Daniel Edward Richardson, II, Elijah Richardson and Kaleah Richardson. To send flowers or a remembrance gift to the family of Monica Denise Wilborn, please visit our Tribute Store. "Email Address" would like to share the life celebration of Monica Denise Wilborn. Click on the "link" to go to share a favorite memory or leave a condolence message for the family.